Enumerator shows how to use the class QSerialPortInfo for getting information about serial devices that are present in the system. 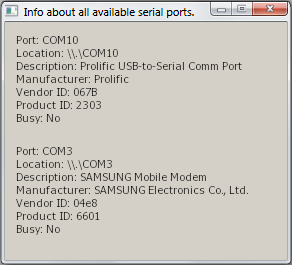 This GUI example displays information about serial ports in a widget, provided by the class QSerialPortInfo. For getting information about the available ports, use the static method availablePorts().